TDS-R – a well-rounded solution for the easy and condensate-free warm air heating of workshops, structurally complete flats or halls. Wherever condensate-free warmth is required directly on site without long air transport routes and with immediate impact, the inexpensive electrical space heaters of the TDS-R series are the ideal choice. Since, in contrast to the directly fired gas or oil heating devices, the appliances neither consume oxygen nor produce combustion waste gases, the TDS-R models are especially well suited for the temperature control in cold rooms, workshops or garages. Thanks to the integrated thermostat control, the produced warm air flow can be continuously adjusted to the desired temperature on all TDS-R models. With respect to the TDS 20 R, based on the thermostat control, the heating elements only switch on if required in addition to the permanent fan. 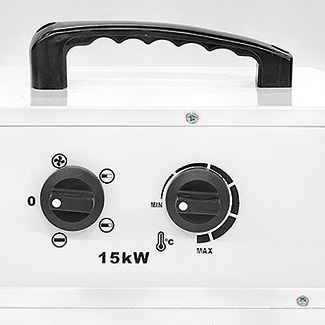 The large 400 V appliances are furthermore equipped with a multi-stage power control for the metering of the heat output in line with demand. Stage one activates the fan and, depending on the model, up to three available heating levels simultaneously increase the heating capacity to the maximum. The TDS 120 R Electrical Space Heater features for easy transportation and safe standing on a trolley design with ball-bearing wheels - the smaller models are equipped with a rugged, ergonomic carry handle. Easy transport and operation – the economic solution with many possibilities for use relating to the mobile electrical heating on site.